The Columbia River Gorge is said to have a higher concentration significant waterfalls than almost anywhere in North America. 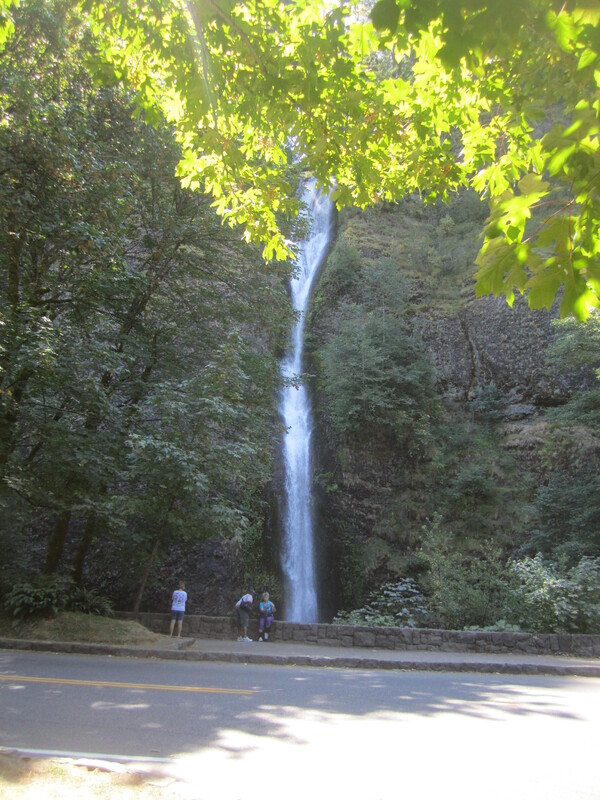 Multnomah is popular as the second highest waterfall in the U.S., but there are dozens of other cascades to view. 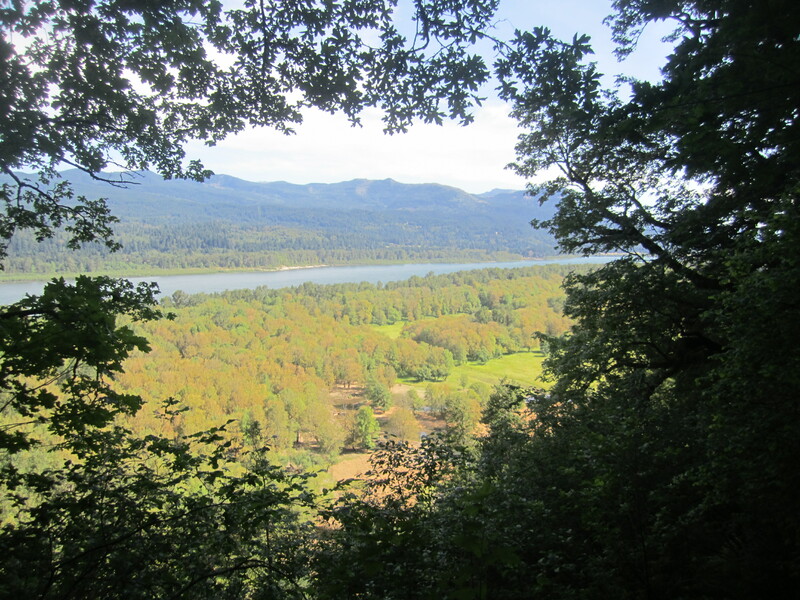 On the Oregon side of the river, it’s easy to have many options and go hiking to various waterfalls, on a small scale or large. 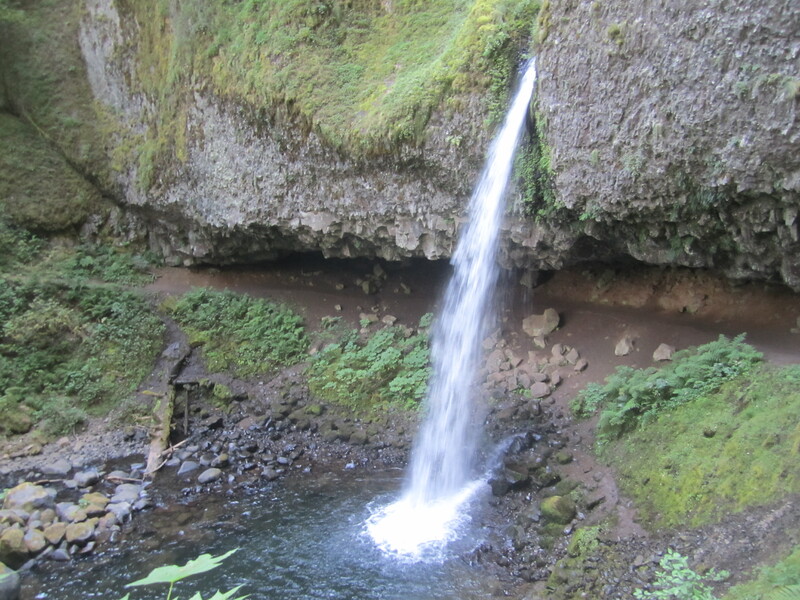 Horsetail Falls is just south of the old scenic highway a couple miles east of Multnomah Falls. 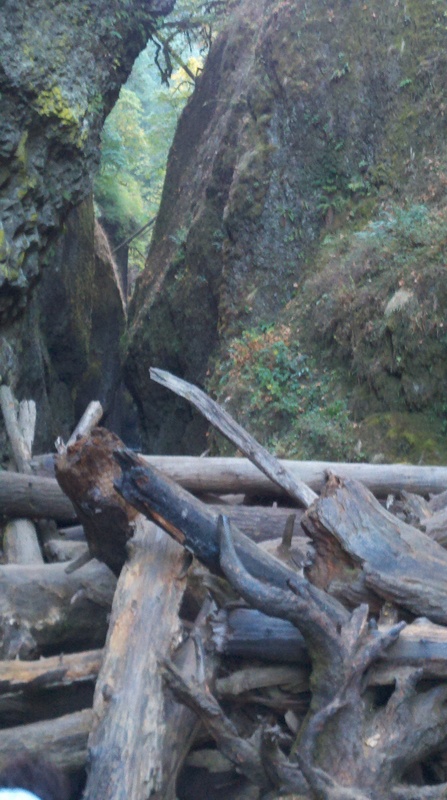 A great waterfall hike begins to the left of the observation area. The path climbs immediately, but it is graded well as it goes through some switchbacks. Traversing the slope, views opened up. 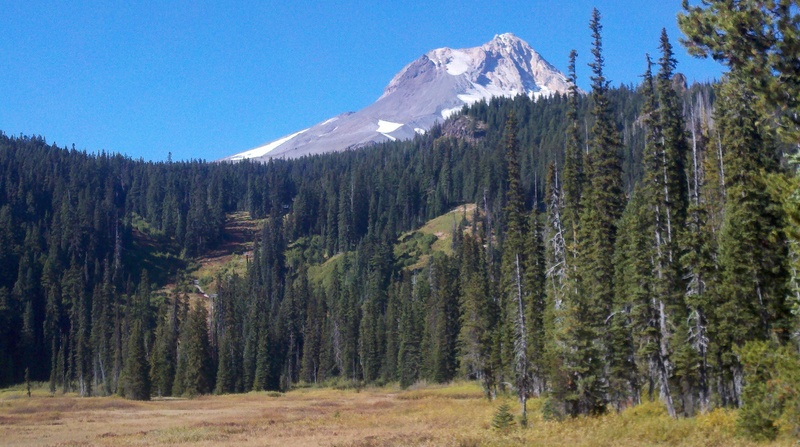 The switchbacks stop in ten minutes and the trail curves back along Horsetail Creek. Soon the trail gives a tremendous look at Ponytail Falls. 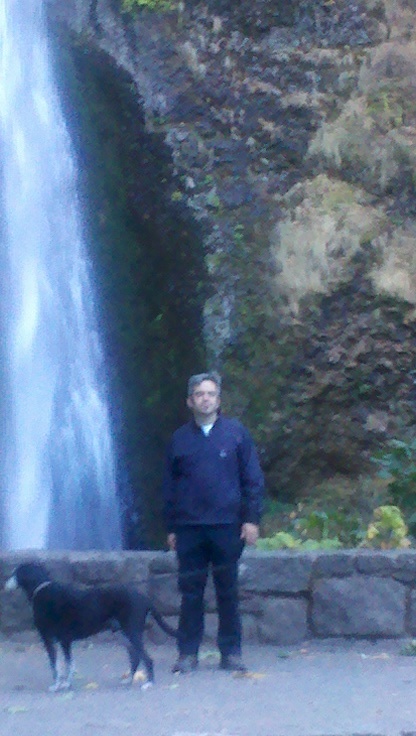 As I approached, I realized the path would actually duck behind the falls. This falls isn’t huge, but this is one of prettier waterfalls I had seen in a while, in the Columbia Gorge or elsewhere. For some reason, looking out at the falls, I felt like Gollum. My precious! I didn’t dally in the lovely spot, as there wasn’t a great place to sit. Time for effort. 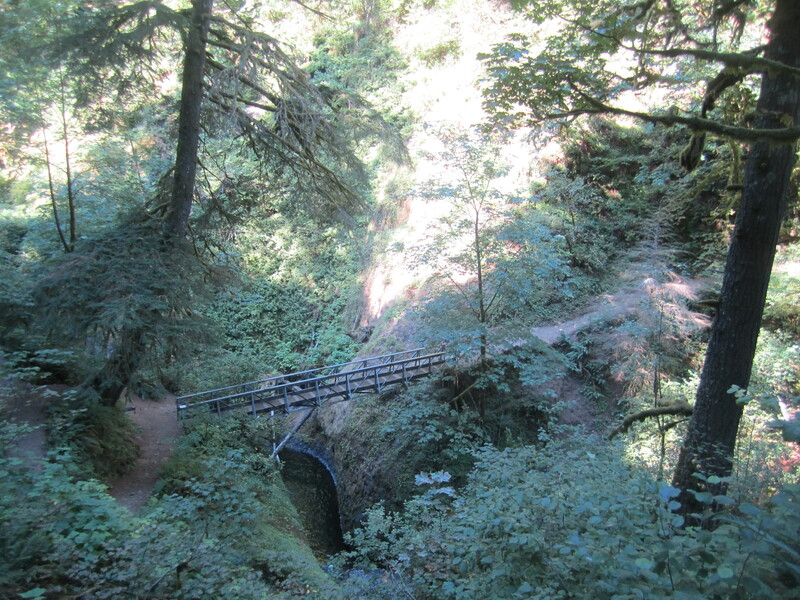 The trail now climbed gradually away from the falls. You can see the obvious dirt and rock shelf where the trail goes behind the falls. Continuing uphill, the trail started required a touch more effort, but that’s okay, as there are still two waterfalls to see. 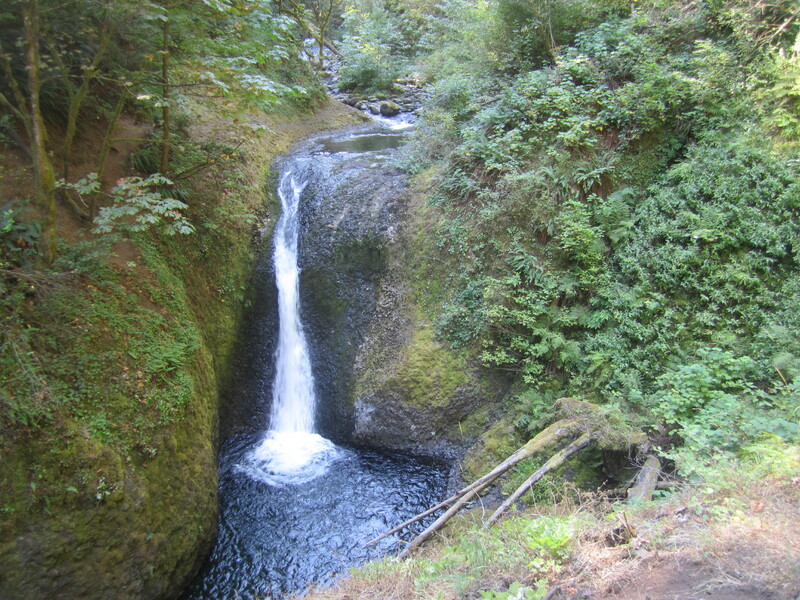 The trail crosses a divide and drops into another canyon, and as it crosses Oneonta Creek, there is a full frontal view of another waterfall. Third waterfall of the day and it hasn’t even been an hour. A junction shortly above this third falls gave me a choice. 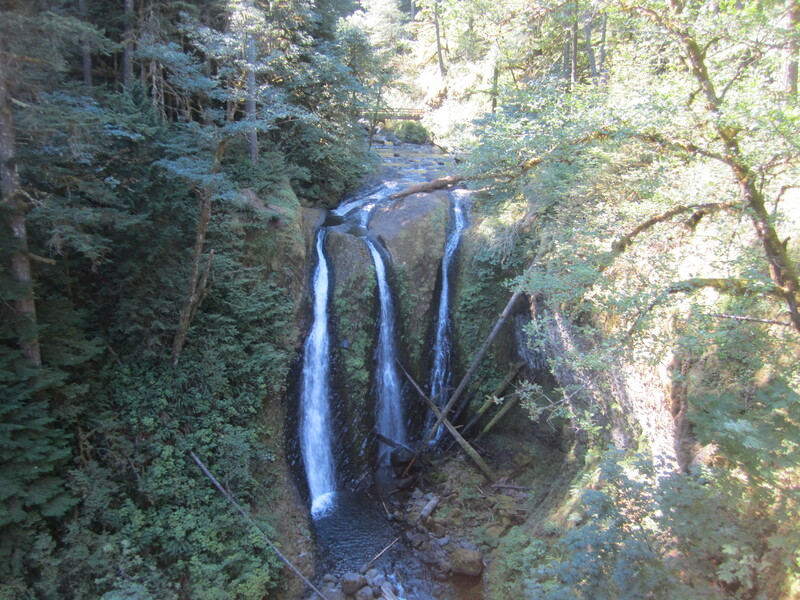 I headed uphill to see the elusive Triple Falls. 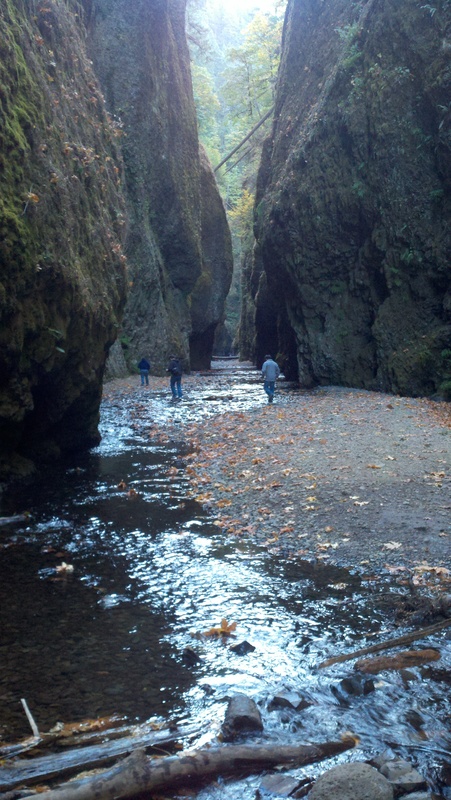 I knew the path in the other direction headed down to the old Gorge Highway near Oneonta Gorge. We’d save that for later. The hike to Triple Falls from here required some sweat, but it was worth it. 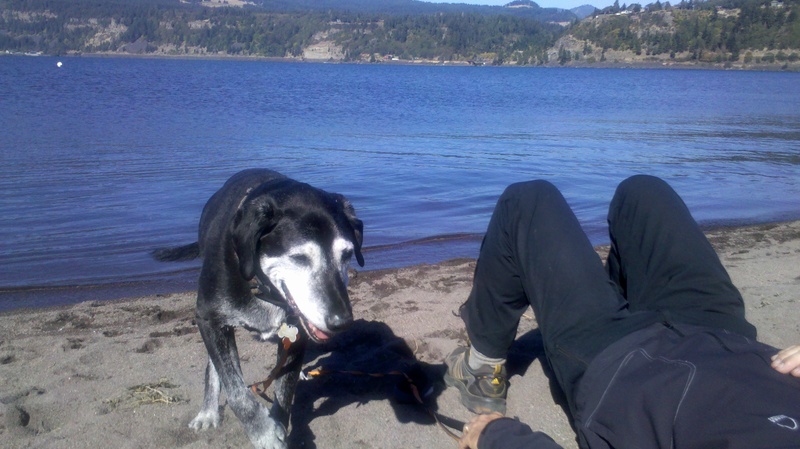 After a quick photo op, the pup and I continued to the bridge beyond, and found a spot to relax for ten or fifteen minutes. Two other groups arrived at the bridge within a few minutes. We all seem to have the same idea, taking a load off for a while and enjoying the lovely area near above the waterfall. After the aforementioned relaxation, we wandered uphill for a while. It connects to other trails, but I had no time for massive loops. I was just here for a nice little waterfall hike. After a rest, I continued uphill behind the father and son for ten minutes or so, but eventually turned back. I passed back over the bridge, got another great view of Triple Falls, then motored downhill while I still had some pep in the step. I veered off at the junction to get some views to the west. As the trail came around a ridge, there was a very tired sign for a viewpoint. I took a look, then quickly continued down the main trail. The old scenic highway was suddenly right below, and it didn’t take long to descend the rest of the way. I had to walk along the road for a while, but that was fine. The tunnel where the road once went? 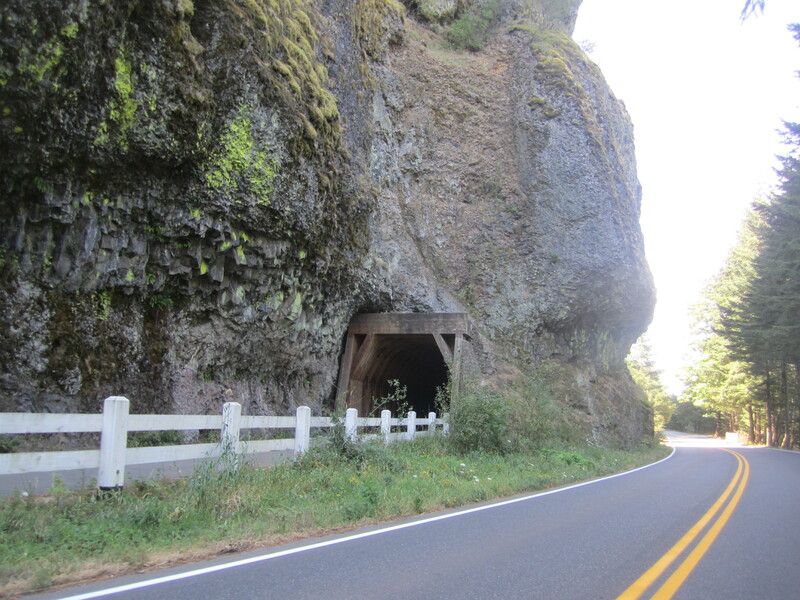 After passing the entrance to Oneonta Gorge, I cruised through a tunnel and was soon back at my car. 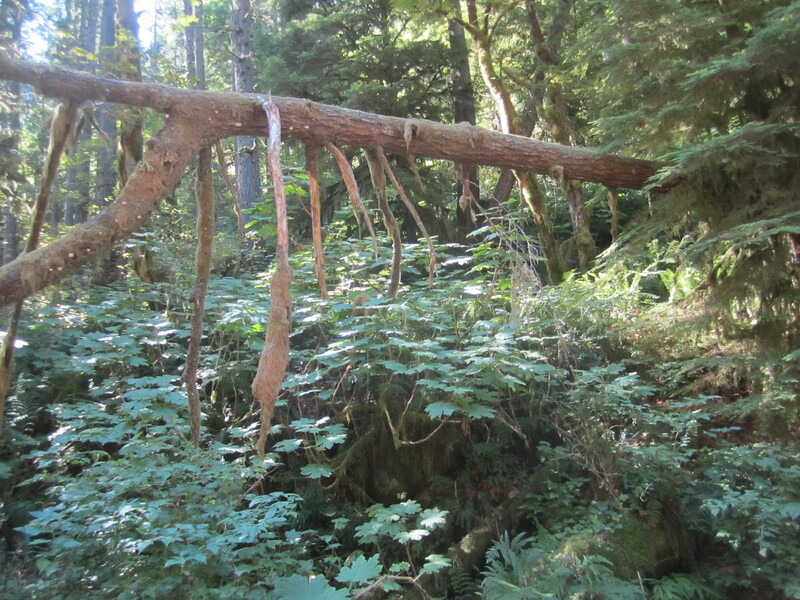 This was a nice hike with a lot of natural beauty. There were a fair amount of hikers, but it never felt intrusive except close to the road. 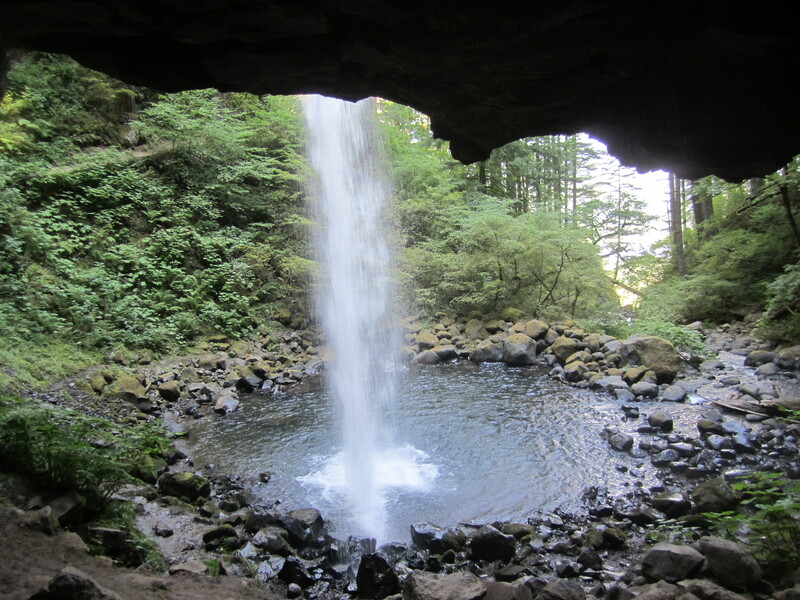 For a modest effort, this trail is hard to beat if you’re in the mood for some waterfall hiking.